Interactive webinars featuring customer success stories and guest independent research firms to illuminate the mobile opportunity and what disruptors are doing to seize it. Urban Airship and Forrester Research, Inc.
Join guest Julie Ask, Vice President at Forrester Research Inc. and Bill Schneider, Director of Product Marketing at Urban Airship. Mobile has fundamentally changed customer expectations. They expect access to anything, anytime, anywhere and in context. Organizations that are successfully navigating this shift are transforming their customer journey into mobile moments. In this webinar, we'll present strategies and technologies to help you navigate the new mobile mindshift and seamlessly stitch together a contextual view of your customers. New data listening technologies that bridge key customer events in an offline system like a CRM with the rich behavioral mobile data captured by Urban Airship, can make your messaging more personal and relevant. Studies have shown that segmentation on even one data attribute like location history can increase mobile response rates by 4-7x. Join us to hear how the leaders in mobile are winning the hearts and minds of the mobile customer. People already check their phones on average 200 times per day, primarily for functions outside of the app. Imagine how frequently they will check their watch when notifications and glanceable moments are as conveniently placed on their wrist. From flirting (download) to happily ever after (constant re-engagement), dating apps use gamification & messaging tactics very effectively to form an essential engagement habit. If someone has downloaded your app, chances are they have an awareness and the start of an affinity for your brand. How do you keep your place on their device and keep the mobile relationship going strong? We'll share brand examples that helped create loyal customers. In its recent launch announcement, Apple did more than hype a nifty watch and a ground-breaking mobile payment solution. With iOS8, Apple has made push notifications interactive, letting you engage with your customers in a whole new way. • Product experts from Urban Airship will be on hand to discuss these topics and address questions and comments. Product experts from Urban Airship will be on hand to discuss these topics and address questions and comments. Is your app helping you win the battle for screen time? Consumers have hundreds of mobile moments every day, and every retailer is scrambling to get their fair share. Your customers are pre-shopping on your site, showrooming in your store and tweeting their mobile-commerce purchases with device in hand. 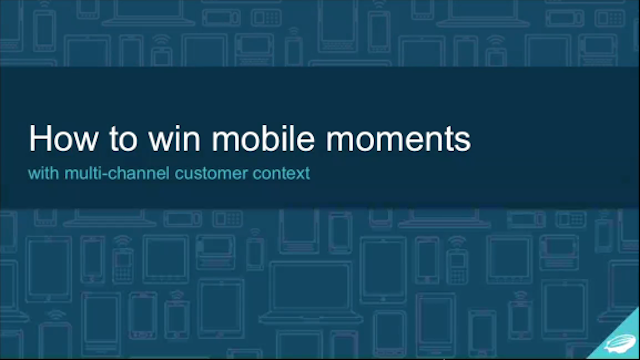 How are you creating mobile moments that matter to your customers? How will you deliver relevant information and get profiling data in return? Who is leading—and why—in the race to embrace mobile customers. Join Forrester Research, Inc., and Urban Airship for a live webinar March 20 at 10 a.m. Pacific to showcase a new data study that reveals trends among the most sophisticated mobile adopters by industry. Findings in the Mobile Maturity Benchmarks Report represent survey responses from nearly 500 marketing and technical leaders and senior executives. Respondents shared which mobile tactics are used in their organization, who is responsible for mobile innovation and decision-making, how mobile results are measured, and hurdles/drivers for future mobile development. •Steps you can take to evolve your app on the Mobile Maturity spectrum. Urban Airship is excited to unveil the next generation of our Mobile Relationship Management platform. The new suite of tools helps brands transform the experience they deliver to their mobile customers. Join us for a webcast to learn about real-time marketing automaton, iBeacon targeting, dynamic audience segmentation, and more — allowing for more relevant, contextual messaging than ever before.